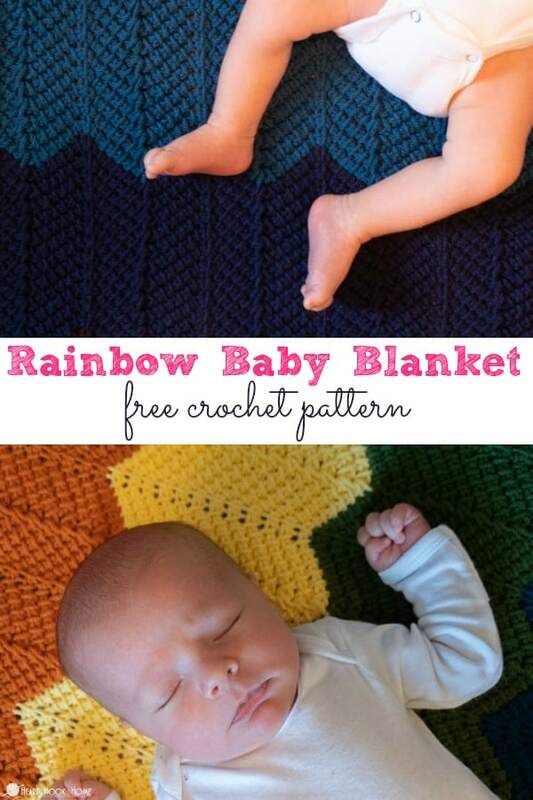 If you are looking for the perfect Rainbow Baby Blanket for a rainbow baby in your world, this free crochet pattern is perfect for you! 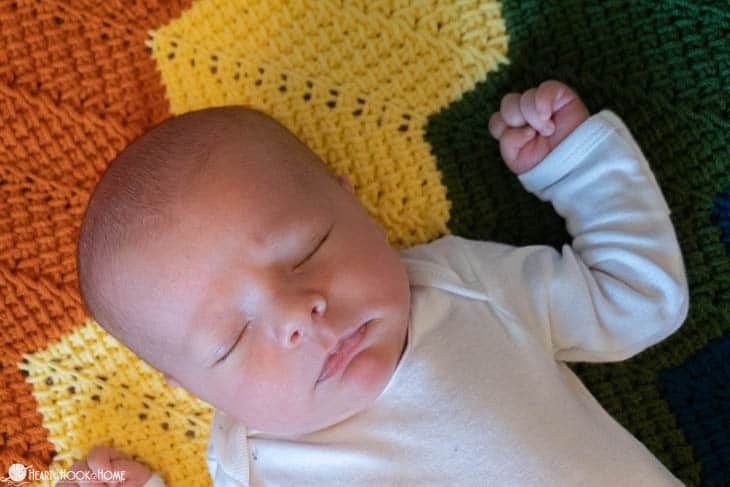 This little guy is a rainbow baby himself, and an adorable one at that! 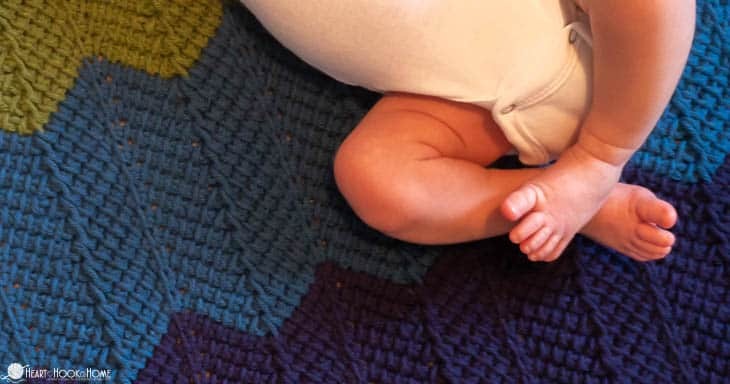 When on gauge the finished blanket will measure approximately 36″ x 36″. In my opinion, this stitch is easier to understand when you see it done. 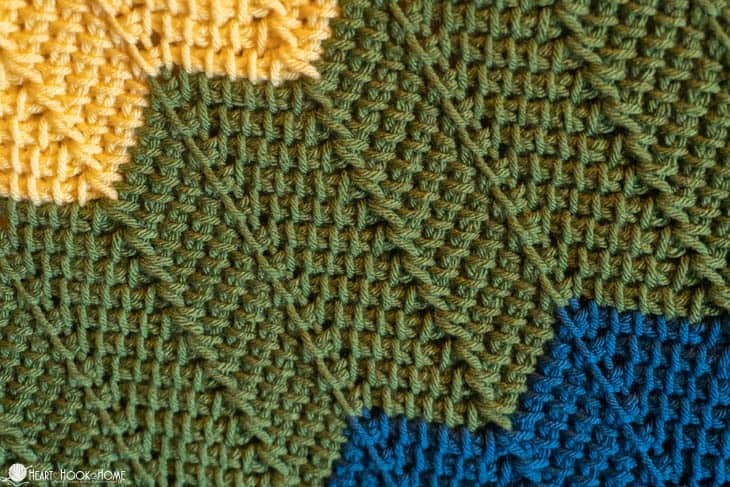 Should you need a tutorial for the Tunisian Chevron stitch (available in written or video format here), you’ll want to master that first, then start with the free pattern below. To change to a new color, you’ll use the new color to pull through the last two loops of the backward pass. 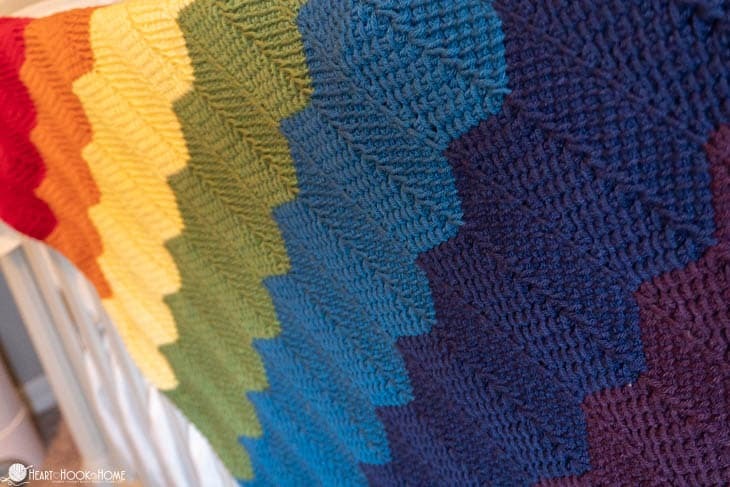 This is very similar to how you change colors in regular crochet. Row 1: Ch-169. Pull up a loop in back bar of 2nd ch from hook and each ch to end. 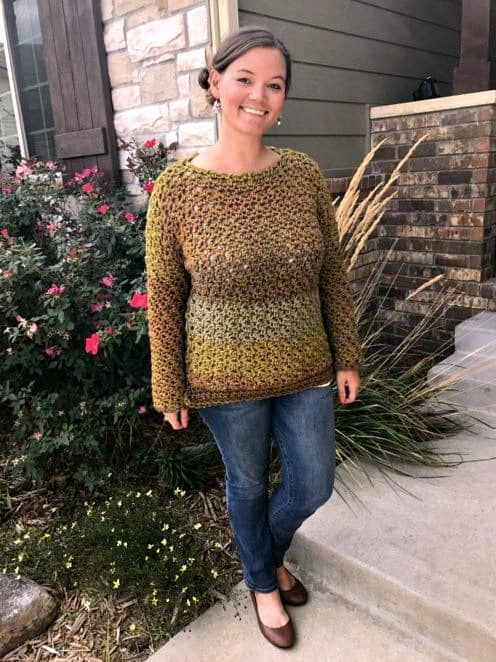 Backward pass: Ch-1, * yarn over, pull through two loops. * repeat between * * to end. Rows 2 – 12: Sk first bar. * Yo, Tss in next st. Tss in next 4 sts, Tss3tog. Tss in next 5 sts. Yo, Tss in next st. * repeat between * * to end. Backward pass: Ch-1, * yarn over, pull through two loops. * repeat between * * to end. Rows 3 – 24: Sk first bar. * Yo, Tss in next st. Tss in next 4 sts, Tss3tog. Tss in next 5 sts. Yo, Tss in next st. * repeat between * * to end. Backward pass: Ch-1, * yarn over, pull through two loops. * repeat between * * to end. Rows 25 – 36: Sk first bar. * Yo, Tss in next st. Tss in next 4 sts, Tss3tog. Tss in next 5 sts. Yo, Tss in next st. * repeat between * * to end. Backward pass: Ch-1, * yarn over, pull through two loops. * repeat between * * to end. Rows 37 – 48: Sk first bar. * Yo, Tss in next st. Tss in next 4 sts, Tss3tog. Tss in next 5 sts. Yo, Tss in next st. * repeat between * * to end. Backward pass: Ch-1, * yarn over, pull through two loops. * repeat between * * to end. Rows 49 – 60: Sk first bar. * Yo, Tss in next st. Tss in next 4 sts, Tss3tog. Tss in next 5 sts. Yo, Tss in next st. * repeat between * * to end. Backward pass: Ch-1, * yarn over, pull through two loops. * repeat between * * to end. Rows 61 – 72: Sk first bar. * Yo, Tss in next st. Tss in next 4 sts, Tss3tog. Tss in next 5 sts. Yo, Tss in next st. * repeat between * * to end. Backward pass: Ch-1, * yarn over, pull through two loops. * repeat between * * to end. Rows 73 – 84: Sk first bar. * Yo, Tss in next st. Tss in next 4 sts, Tss3tog. Tss in next 5 sts. Yo, Tss in next st. * repeat between * * to end. Backward pass: Ch-1, * yarn over, pull through two loops. * repeat between * * to end. To finish: Sl st in each vertical bar across. On the bottoms of the Vs (where the TSS3tog are) slip stitch all three of those bars together. 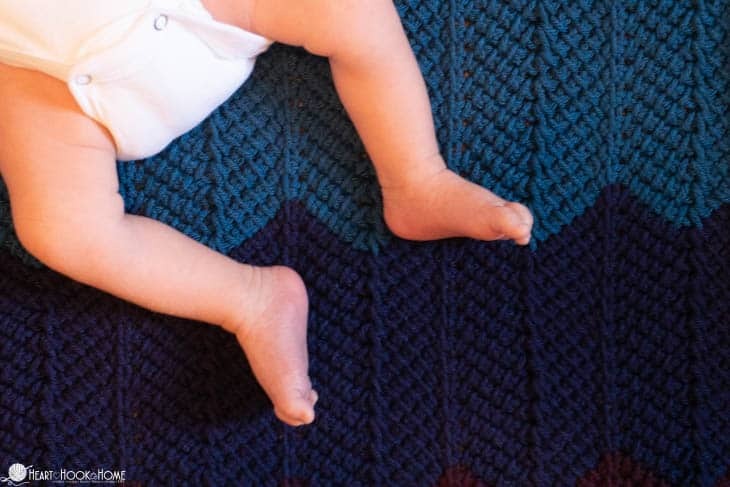 Need more help finishing the blanket? Watch the end of this video tutorial.